The Amazing Pets Show at Grand Country Music Hall is one of the most popular family Branson shows as it provides humorous and entertaining antics by amazing animals and performers you’ll ever see. This morning Branson show starts your day with fascinating performances of amazing pets that the kids will love. This amazing pets show that you can enjoy early in the day allows you to catch an afternoon or evening show or see other exciting activity at many other attractions in Branson. Featuring many different types of animals (many have been rescued) – this show is something you won’t want to miss on your next visit. You will find in this amazing pets show trained house cats, dogs, exotic and beautiful birds, and even a monkey that will keep you laughing and smiling throughout the whole show. You’ll surely be amazed with what these furry and feathery creatures can do. While the amazing animals take center stage, you will see a variety of acts that will let you enjoy more of the show. Aside from enjoying what the amazing animals can do, you will see for yourself some of the artists perform comedy and juggling. As you watch this award-winning production, animal trainer and master of ceremonies Sean Paul will take you on a trip filled with fun and excitement during your time with him and the rest of the cast in one of the most amazing Branson shows you will ever see. This show has been recognized for its amazing performances of a variety of animals and even won the “Best Specialty Show” by Branson Critic. Featuring breathtaking acts and incredible tricks from a troupe of skilled dogs and trained housecats, the Amazing Pets Show is a must-see Branson show. This fantastic family fun show is the only one in Branson. With the amazing cast of furry creatures, they’re sure to win your hearts as they perform incredible acts and tricks. The more than 30 well-trained animals do a variety of tricks, a bit of magic and a whole lot of funny acts. Many of these creatures have been rescued from animal shelters across the country. In addition to these talented animals performing fascinating acts, you’ll see also beautiful exotic birds and many other magical surprises that are sure to amuse you. These amazing felines and canines featured in the show that include a group of exotic birds make a truly entertaining show in Branson. You will also find an amazing performance of a counting donkey and even performing pigs. You will surely have fun and excitement as you see cats meowing and hopping through hoops, dogs riding bikes, barking, and jumping, it’s all included here. Throughout the show you’ll witness a number of tricks performed by the cast of furry friends. This fast-paced show is brought to Branson stage with wholesome fun and excitement. 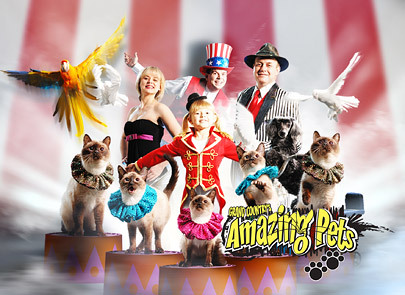 As one of the most popular family Branson shows, the Amazing Pets is a show not to be missed on your New Year vacation.